Properties in Ayguetinte average 4.8 out of 5 stars. 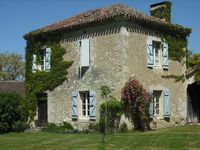 Property 7: Do you love Sunshine, Sunflowers and Armagnac? Property 11: Beautiful stone house with stunning panoramic views set in idyllic countryside. 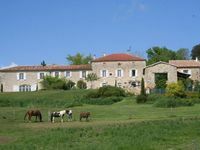 Property 35: Gorgeous farmhouse with plenty of atmosphere, and a large swimming pool. This lovely farmhouse was the perfect escape for me from the bustle of my Paris adventure. The setting is idyllic, extremely private and quiet. It really was like my own private retreat amongst the sunflower fields, birds and scattered farms dotting the countryside. The house was comfortable and charming. I could take a stroll, lounge by the pool or bike around the area to appreciate the beauty.The entire property just invites one to relax and take in the surrounding vistas. There is a small village 10 minutes by car to get supplies or dine out. This is the ideal family or friend vacation home for those looking to get away and reconnect with loved ones. I will definitely be back again when the sunflowers are in full bloom to witness how glorious that must be!